I have some big, big news: I SOLD A NEW BOOK! I'll just do a cheeky copy-and-paste from Bloomsbury's official press release . . .
Alexandra Pringle, Editor-in-Chief at Bloomsbury, has bought World English rights in The Priory of the Orange Tree by Samantha Shannon from David Godwin at David Godwin Associates. The Priory of the Orange Tree is a standalone fantasy that draws influence from Eastern and Western mythology. In the novel, a war between dragons has divided the world, reducing humankind to a shadow of its former strength. It is told through the eyes of four characters from very different backgrounds. ‘Samantha Shannon is a writer whose imagination and flair is evident in all her work, but in this gripping new fantasy novel she combines chivalric legends, dragons, Elizabethan court life, magic and Japanese folklore to stunning effect. It further confirms that Samantha Shannon is one of the leading fantasy writers of her generation,’ says Alexandra Pringle. 'Samantha really is an astonishing talent. This is a fabulous book,’ says David Godwin. The Priory of the Orange Tree will be published by Bloomsbury in hardback and eBook. It's always so surreal when you're finally able to talk about a book after months of working on it in private. Still pinching myself. The Priory of the Orange Tree – I'm finally sharing the title! – is a novel I've been writing for a few months now, which my agent sold to Bloomsbury about two weeks ago. I worked on it most intensely during National Novel Writing Month last year, when I wrote 50K words of it. You may remember me discussing it, albeit mysteriously, in this blog post. It's a standalone high fantasy inspired by Eastern and Western history and mythology, including the tale of George and the Dragon, which is one of the strongest influences on the central storyline. I sold the book based on a partial draft, so I now have to, you know, actually finish it . . . but I'm confident that I can divide my time between this manuscript and the fourth Bone Season book. I might have to get a coffee drip permanently attached to my hand, but I'm raring to go. My aim is to get a full draft of both Book 4 and Priory handed in by December. I work well under pressure. Note: I'd just like to reassure you, before I continue my outpouring of excitement, that this book is very unlikely to affect the publication time of Book 4, which will be published in 2018 at the earliest no matter how quickly I work on it. Because The Song Rising's publication was delayed, I have plenty of time to work on two projects. Before I dig into where this book stemmed from, here's a few tidbits about The Priory of the Orange Tree. I started working on it while I was waiting for my editor's notes on The Song Rising. I finally went to the British Library and got a membership so I could research it. It's told in third-person by four different characters – two men and two women – who are all from different backgrounds, cultures, and parts of the world. One of the men is called Loth. I love them all. There are a lot of dragons in it. Talking dragons, non-talking dragons, dragon-like beasts of legend. 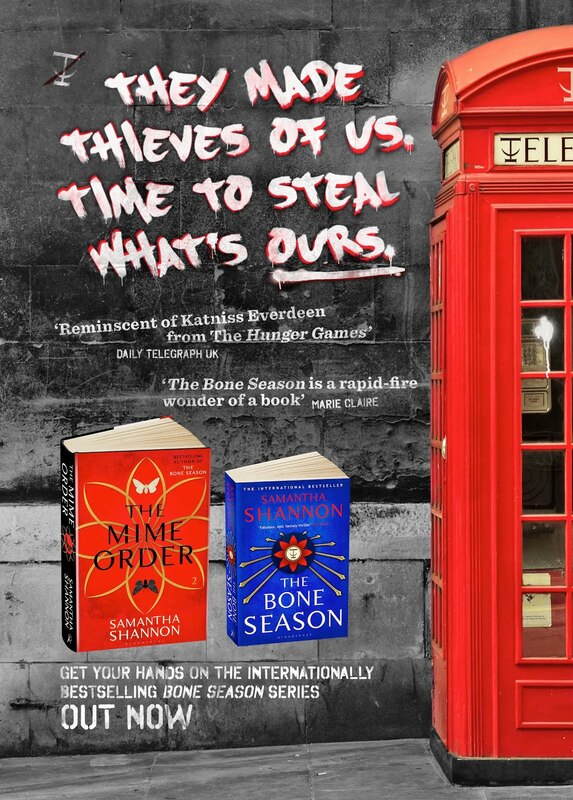 Unlike the Bone Season books, it's set in a world that's separate from ours. However, each of the countries in it is inspired by a real country. It contains many references to real sixteenth-century world history and people. This was the period I chose as my touchstone for the setting after my little brother asked me for help with his history homework on the Spanish Armada one night. Before he did that, I'd been drafting the story, but the setting had never quite worked. Once that clicked, I couldn't stop writing. The Priory of the Orange Tree is my original working title. One of the other titles I considered was A Little Season, but . . . well, I don't want to, er, over-season my ouevre. I'm honoured to be with the amazing team at Bloomsbury again for this book, which is the realisation of a childhood dream. I've wanted to create something to do with dragons since I was a little kid, when I first watched Dragonheart. My friends and I went to see it at the cinema for my birthday in 1996 – I asked my parents if I could have the celebration in the summer, rather than November, just so it would coincide with its release. When I got it on video, I recorded the whole film on a cassette tape and played it back to myself like an audiobook, so often that I pretty much memorised the dialogue. I even loved the direct-to-video sequel, even though it paled in comparison to the original. (I will eventually watch the third installment, which I only just learned about, when I decide that my soul can take it.) The theme music still gives me chills. After my Dragonheart initiation, I went full dragon-crazy. They came just above dinosaurs in the hierarchy of obsession. I played Drakan: The Ancients' Gates on my PlayStation 2. As soon as I heard about Reign of Fire, it joined my DVD collection. I was enthralled by Cornelia Funke's Dragon Rider, which I read over and over again as a child. Same for The Hobbit. I devoured all the information I could about the different species of dragon in Harry Potter – I made sure to buy a little pot of Hungarian Horntail dragon heartstring at LeakyCon a few years ago. I was gutted when Maleficent didn't actually turn into a dragon in live-action movie. One of my crystal-clear memories from school is of the day I discovered The Fire Within by Chris d'Lacey in the library, where I would sit for hours and imagine tiny dragon figurines stirring to life. I was the very proud owner of The Dragon Hunter's Handbook. And of course, I love Game of Thrones as much as anyone – there's a reason Dany's storyline has always been my favourite. When I was about ten, I even wrote a few chapters of a book called Inferno, about a girl named Cleo who discovers that dragons live in Area 51 and do battle with demons. (Samantha Shannon, the ten-year-old Area 51 conspiracy theorist.) And my writing ‘mascot’ is a little statue of a purple dragon hatching from an egg. So, in a nutshell: I have loved dragons for nearly twenty years. Inferno was abandoned to the bottom drawer, but I never let go of the idea that I would one day return to writing about them. The Priory of the Orange Tree is about what happens to humans when dragons exist; about the collision between cultures and religions; about love, war, survival, and adventure. As I said above, it's told in third-person, making it quite a different animal from The Bone Season, which is all told by Paige. Third-person is the style I naturally gravitated towards before Paige's voice exploded into my head, and it was quite a strange experience to go back to it after all these years, but it seemed right for this story. I've had so much fun building the relationships between them, working out where their lives intersect, bringing them together and pulling them apart. I'm thrilled that you're all going to be able to meet them. In Bone Season news, we're very close to finally sending The Song Rising off to the copy-editor, which will conclude several months of incredibly hard work on it. I'm probably going to take a week off to catch up on my sleep, but I'll be straight to work on Book 4 after that. (And once I've finished a secret Bone Season-related project I'm working on this month.) I have a working title and a Word document all ready to go. This book, which will be set in Paris, will round off the first ‘arc’ of the Bone Season septology and sees events in Scion take an even darker turn. Paige is going to go through a great deal of change, not always for the better, so I'm approaching it with a mix of trepidation and excitement. There are some pretty gut-wrenching scenes in this one that I've envisioned writing from the very beginning. As I've said before, I think Book 4 will be the shortest of the Bone Season books, with either the same number of words or slightly less than there are in The Song Rising, which is currently at just over 126K. It's amazing to think that by the end of next year, I'll be working on Book 5, which I've always believed will be my favourite of the whole saga to write. To break up the wait: don't forget that you can finally buy the eBook of On the Merits of Unnaturalness this week! Pre-order links can be found here. This sounds wonderful, congratulation!. Can't wait. Congratulations, Samantha! This is such exciting news. I'm always looking forward to new books from you, and to hear that you have one about DRAGONS just made me super happy. Cannot wait!! Can't wait to read it!! Just bought on the merits as well. Thanks so much for getting it published Samantha Shannon. Has anyone got any fantasy book recommendations? Desperately need something new to read. The ya books I read recently haven't been that great. I'm reading a series called The First Order by Joe Abercrombie. It's pretty good. I wouldn't say it's young adult though, if that's what you're after.